The mile and a quarter track’s situated right next to a ditch – it’s located in a wetland swamp – that runs along the backstretch. Clearly this compromised the entire layout of the facility, explaining its oddly skinny, paperclip shape. More roval than oval, the racing at Gateway failed to please, with little of the side by side racing and almost none of the constant passing other larger, properly laid out ovals like Texas and Pocono routinely provide. Helio and Team Penske dominated the race – SPOILER ALERT – running away with it in a show we’d seen all too often before (including the two previous years’ Indy 500s). It wasn’t even close, as “Snake” Castro-Neves led the most laps in a true Hollywood style farce, except that Roger “the brain” Penske’s team were the only ones in on the joke. Had we not been in such a hurry to escape East St. Louis, we’d have rightfully demanded our money back. Happily however, some changes and upgrades have been made since those bleak days decades ago. Obviously the speedway retained its retarded configuration, but did receive a brand new asphalt surface this summer. This may or may not improve the racing, but was deemed necessary after a test session so bizarrely topsy-turvy A.J. Foyt Racing‘s Conor Daly set the pace. Plus it’s a 500 miler which will, like the movie, dramatically take place at night. It’s not clear if Ed Carpenter Racing will benefit from John Carpenter’s former film production, though it should be noted the two aren’t related. One thing is certain. If this year’s race is even half as entertaining as the weak sequel “Escape From LA,” then the show’ll be miles better than the last flop of a race at Gateway. 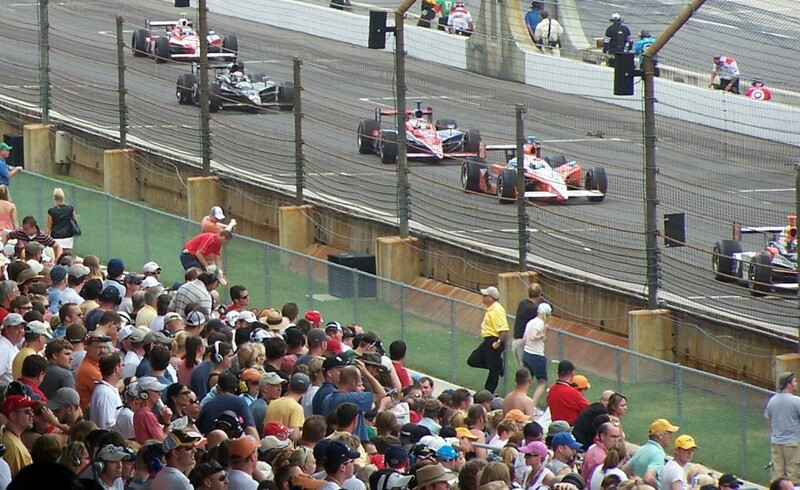 This entry was posted in "Escape From New York", AJ Foyt Racing, Barber Motorsports Park, Conor Daly, Ed Carpenter Racing, Helio Castro-Neves, IndyCar racing, adrenaline and death defying speed, John Carpenter, Pocono Raceway, Roger Penske, Team Penske, Texas Motor Speedway, Tomas Scheckter and tagged Bommarito 500, Gateway Motorsports Park, IndyCar, IRR, irreverent humor by IndyRaceReviewer. Bookmark the permalink.